I recalled a conversation I had the previous day with a lovely Tamil man of great intellect and capacity for empathy. Although I don’t have many men friends because of too many betrayals, this was one man, I thought, in whose hands I would joyfully place myself in the full trust of friendship. (May 26, Colombo, Sri Lanka Guardian) We boarded the bus from Haputale to Colombo early enough so that the six-hour journey would get us in to our guest house with time enough to nap before dinner. Our time in Haputale was one of the most interesting and transformative experiences we've had. Both of us declared that we would need a long time and some physical distance from the town to process it all; so we thought we were free and clear to begin the work once we’d boarded the bus; but then we hadn’t counted on the power of synchronicity to turn up in the guise of an ostensibly sweet older man in whom the experiences of the previous ten days began a process of rapid distillation that left us spinning with the fumes of noxious brew that I can still taste at the back of my throat. "Hello! Where you from?" The dapper older man issued the usual greeting with the perennially linked question that most Sri Lankans ask in meeting any English speaking person for the first time. The bus pulled away: “Canada”, I replied. “Ahhh! Canada”, he beamed a glittering smile that can only be delivered under the sun of this blooming paradise. “Nice country!” He added, with the subtlest shift in emphasis, as if a sliver of tissue paper had been tossed onto one side of the scale of equanimity. “Lots of Tamils there in Toronto”, he noted, still holding his smile behind a wisp of cloud. The sun broke through the trace of cloud and the dapper man redirected its beams through a magnifying glass, so that his smile became an ugly distortion of courtesy: “New Zealand is a very good country; so beautiful! A very, very good country! Lots and lots of Sri Lankans there too—Sinhalese! Not many Tamils”, he wagged his head. “So much trouble here in Sri Lanka”, he became grave. “The Tamils bring so much trouble”. Now I knew his agenda and began the verbal and body-language detachment that signals the end of a conversation; but like an evangelist on a mission, he was blind and deaf to anything but himself and his own opinions. We were beginning the long descent of the Colombo Road from Haputale. He gestured with his hand outstretched, palm upturned toward the magnificent hills where his fingers seemed to reverently touch Lipton’s Seat, that high vantage point from where Sir Henry Lipton would go to capture in a single view all he owned, land and labour; our fellow traveller swept his arm in one great arc that passed over the plantation valleys where insignificant points of colour slaved under the sun along the lush terraces of green--all below the horizon of his limited vision. “This is their land too! Beautiful! And they want to destroy it! And we are so good to them!" He looked hurt. "But okay now; fighting is over”, he smiled with a look of victorious satisfaction. He paused, as if to assemble the rank and file of forces in his imagination: “I’m a police officer”, he declared, putting his authority to speak in no doubt. “They must be punished! All of them! There must be discipline!” Toxicity leached from his skin. I recalled a conversation I had the previous day with a lovely Tamil man of great intellect and capacity for empathy. Although I don’t have many men friends because of too many betrayals, this was one man, I thought, in whose hands I would joyfully place myself in the full trust of friendship. He talked with great restraint about the daily plight of the Tamils who work the plantations: rudimentary housing; low wages; impaired earnings during the dry season; the hopelessness that pervades the community; and the structures of authority that holds it all together—the Tamil Kagani, or field boss, who is hired out of his own hopelessness into a position of betrayal, to strut and threaten with his presence, and sometimes his violence, workers that are not producing to his satisfaction. I met the man’s aunt, a tea picker, who showed me her lacerated and calloused hands; she permitted me to touch them and I was moved. The Tamil man who would be my friend does not believe in violence. Nancy had moved to a more comfortable seat behind the driver. I excused myself from conversation with the officer, gesturing to my hearing aids and the roar of the engine from under the engine cowling that separated us, on the fore and aft bench-seat, from the driver. The officer sat against the windshield—we might say in Canada that he was riding shotgun—a position of power. I swung across the aisle to sit beside Nancy just as she let out a yell of surprise at a sprawling, irregular line of about two hundred Sinhalese soldiers doubling (running) up the long, daunting hill in full uniform under the tropical sun, and carrying rifles in any manner that would relieve the agony of their terrible ordeal. “Punishment!” The police officer exclaimed dispassionately. We watched them all as they struggled, faces twisted in Dantesque agonies as they were cajoled and berated by their tormenters dressed in cooler running gear. Further down the hill, some stragglers appeared ready to keel over, but were tormented all the more by their senior officers. Collective punishment for the transgression by a minority is a perverse strategy of team building within the military that also works in acts of brutal repression of one’s “enemies”. The young Sinhalese soldiers were still struggling up the hill and I wondered if any of them really knew why they were being punished, or even had the capacity at this stage of their indoctrination to delve into places of ethical introspection. How would the rage of this injustice and other training injustices become so deeply embodied, along with the immense physical strength that comes out of training, and then be directed by superior officers against others--the "enemy", whoever they might be--in mindless acts of further brutality. I thought of the police officer nearby still impassively watching the soldiers. After going to see a number of schools in and around Haputale, I recalled a horrible scene just a few days before our departure, in which several teenage Tamil boys dressed all in white were being beaten by an enraged male teacher who towered over them. He had snatched a thick stick from a tree and was indiscriminately beating the boys about their arms, legs and bodies as they stood—dissociated--too scared to run. Other children, from 6-18 years, and women teachers looked on in obvious horror. Other images followed: Pakistani police with their lathis beating people at political rallies; Indian police with their lathis beating slum dwellers and beggars; English police beating people with their batons at political protests; American police with their nightsticks in Seattle. 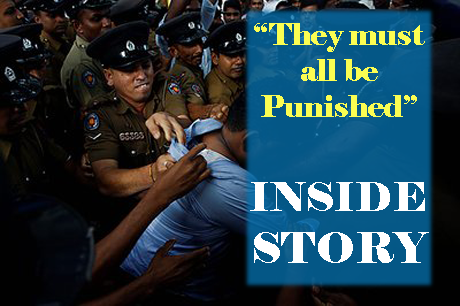 The pain and humiliation of the Tamil boys' beatings continued. I looked across at our friendly police officer. I remembered a poster on a Sri Lankan bus I'd seen a couple of weeks ago. It advertised, “Stop Child Abuse!” Below the caption were a police hotline phone number and a helpline number for offenders. There had been persistent efforts to tear away the poster from the edges, which had partially defaced the phone numbers and the ability of using this poster to make a successful call. At first I thought that parents, incensed that anyone would assume the right to tell them how to raise their children, were probably responsible for the defacement; and then I saw the teacher with his stick tucked under his arm, furtively picking away at the poster; our friendly police officer stepped in to help, concentrating on getting his fingernails under the edge of the police hotline phone number. I looked across at him, but he was only staring with steely eyes at everything that offends. At the halfway point in our journey, the bus stopped in a small town for refreshment and a toilet break. When I returned from the toilet, Nancy reported that the police officer had had ranted at her about Tamils. Repetition really. There was a lot of hubbub, so it gave Nancy and I a chance to talk. She told me that the bus had stopped at the kovil (Hindu temple) on the way out of Haputale (I hadn’t noticed). The conductor had quickly entered the kovil and returned with a quantity of holy ash with which both he and the driver had marked their foreheads and cleansed their hands for the journey. The driver used some to cleanse the steering wheel and the sun visor. Clearly they were both Tamils. Now I understood that all of the police officer’s venomous racism was being spoken openly in front of them as if they did not exist, for surely he knew they were Tamils. Several Tamil beggars entered the bus with their own sad stories in order to earn a few rupees while at the station. He dismissed them in Sinhalese or Tamil--I’m not sure--and they shuffled on. Nancy returned with some food for our lunch; and until everyone could get organized, she sat beside the officer. “You have beggars in Canada?” He asked her. “No”, Nancy replied. Our officer wagged his head and smiled his approval. Perceiving that this friendly officer was once again trying to make a political and moral point, I hurriedly interjected rather more forcefully than I would usually have done in disagreeing with Nancy publicly, but I now wanted this officer to say what was on his mind so that I could engage him directly..
“—Yes we do! We have lots of beggars—everywhere: downtown in Calgary; and Bloor Street is full of beggars! “I only meant that the begging was not as aggressive as here”, Nancy protested; but the officer had found his cause; any conversation between Nancy and I was now irrelevant. “What city is that!” The office exclaimed with his assumption fixed. “Ahhhh!” Declared the officer, his eyebrows lifted, his eyes widened, and his mouth opened, gaping like a striking snake with a cavernous smile of supreme triumph as he leaned forward and wagged his forefinger in my face, convinced once and for all that he had found his Tamils on the streets of Toronto. “Yes!” I continued, “And they’re all white people”, I told a small white lie. “What’s more, the only reason they’re begging is because there is too much wealth at the top with ineffective systems for redistribution to those who are most vulnerable at the bottom”, I emphatically declared.